Even though most people may associate pumpkin with Halloween or a high-calorie pie to be eaten during the holidays, pumpkin is actually a healthful vegetable. According to Dr. Jonny Bowden, Ph.D., a clinical nutrition specialist, pumpkin is an ideal food for your weight loss diet. Consult your health-care provider before making dramatic changes to your diet or your lifestyle. Pumpkin is an ideal vegetable for weight loss. It is low in calories, high in dietary fiber. A 1/2 cup of pumpkin is only 40 calories and contains 8 g of dietary fiber. Dietary fiber is very valuable for dieters for two primary reasons. First, Dr. Bowden explains, high-fiber foods help to curb your appetite because they slow down overall digestion and remain in your stomach for longer than low-fiber foods. Second, dietary fiber slows the rate at which sugar or glucose is absorbed by your body, which keeps your blood sugar levels stable. If you are on a diet, it is important to keep your blood sugar levels as stable as possible. Increasing your blood sugar levels triggers insulin release and unwanted fat storage. It is true that pumpkin can help you lose weight as a healthful addition to your diet, but you should understand that eating pumpkin will not "make" you directly lose weight. The Students' Center for Health at West Virginia University explains that no foods that you can eat will actively burn weight or fat off your body. Weight loss is accomplished by burning more calories than you consume on a daily basis. To utilize pumpkin as a weight loss food, you will need to substitute it for a food in your diet that is higher in calories. For example, if you eat a 80-calorie cup of warm pumpkin with cinnamon for dessert instead of a 300-calorie piece of pumpkin pie, you will have removed 220 calories from your diet. Aside from being an ideal diet food because it is low in calories and high in fiber, pumpkin is very nutritious and has a large amount of vitamins and minerals. One cup of pumpkin has 564 mg of potassium, which is significantly more potassium than a medium banana. 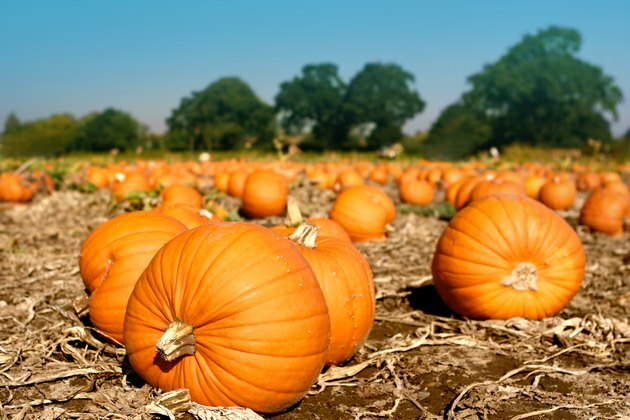 A single cup of pumpkin also contains 5,000 mcg of beta-carotene, which supports your eyesight, and 853 mcg of alpha-carotene, which may help prevent prostate cancer and other types of cancer, according to Dr. Bowden. Additionally, pumpkin contains 12,000 ius of vitamins A and moderate amounts of calcium, magnesium, iron and calcium. If you have only seen pumpkin in the form of a high-fat and high-sugar pie, you may be confused about exactly how you are supposed to eat this vegetable. It can be purchased in an organic form as canned pumpkin at many grocery stores. Dr. Bowden recommends sweetening it with sugar-free sweeteners such as xylitol or erythritol and sprinkling cinnamon on it. You can also add almonds and a small amount of nutmeg, as well. Pumpkin blends in a shake very easily, and you can also use it to make pumpkin protein smoothies. University of Illinois: Pumpkin and Squash are Ready for Eating! Can You Eat Raw Pumpkin?